Do you want to listen to NHPR during the fund drive without the actual fund drive? Make a sustaining gift now for as little as $5/mo or become a Leadership Circle member ($100/mo or $1,200 single) and you'll be eligible to listen to our pledge-free stream! Are you already a sustainer or Leadership Circle member and have questions about how the stream works? Read our FAQ right here. What is the pledge-free stream? The NHPR pledge-free stream is an online stream that provides NHPR news & programs uninterrupted by fundraising breaks. It is active during the on-air portion of regular fund drives. It is not active during our annual Summer Car Raffle. The pledge-free stream is a benefit offered to all active NHPR sustaining and Leadership Circle members with email addresses on file. Want to make a gift and get access? Click here. If you prefer to listen in a browser, you can do so right here, using your passcode. The pledge-free stream is now available through NHPR's iOS and Android apps! Our free NHPR app features a livestream player for both NHPR and ClassicalNH, access to the NHPR pledge-free stream for sustaining and Leadership Circle members, all the latest news stories and program episodes, access to both locally-produced and favorite national public media podcasts, and an alarm feature so you can wake up to the radio! You can get the iOS app through the Apple App Store and the Android app through Google Play. If you’re already a Sustainer or Leadership Circle member, you will receive a welcome email a day or two before the on-air drive begins. 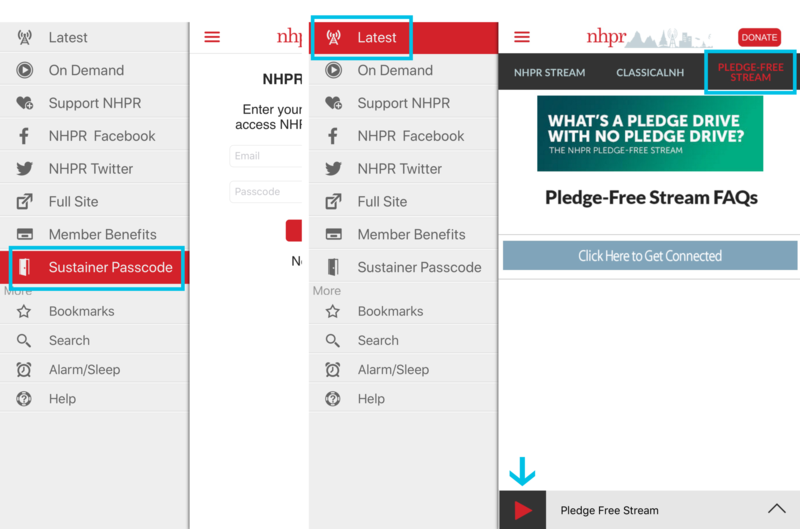 The email will include a passcode you can use to access the pledge-free stream in the NHPR app or via browser. If you don’t receive an email, that means that NHPR most likely does not have an up-to-date email address for you. When you become a new sustainer during a fund drive, you will receive instructions and the passcode immediately if you provide your email address. I’m a sustaining/LC member, why didn’t I receive an email? If you don’t receive your welcome email, first check your junk or spam folder. To prevent this in the future, you can add member@nhpr.org to your email whitelist or contacts. Other reasons you may not have received your welcome email are that NHPR may not have an up-to-date email for you or you may have opted out of email communications from NHPR in the past. If you suspect that is the case, please contact our membership department at pledgefree@nhpr.org to update your record. I make a joint donation with my spouse/partner/family member. Can we both listen? You can! If only one of you receives a welcome email, it is likely we do not have email addresses for both of you. Contact us at pledgefree@nhpr.org and we will update your records. I forgot the passcode. Can you send it to me again? Sure! Contact us at pledgefree@nhpr.org and we can resend. Make sure you're entering the passcode correctly - it's case-sensitive! The player appears to be playing, but I’m not hearing anything. If you don't see a solution to your issue above, or need any other help with the pledge-free stream contact us at pledgefree@nhpr.org. We will respond within 24 hours.